It's St Patrick's Day here in Northern Ireland and below are another two teasers for CD2, both from Sylvester Levay's melodic episodic themes to round off the pure-synth track mixing. The ‘WHERE HAVE ALL THE CHILDREN GONE?’ theme is a medley of four scenes from this cracker mid-3rd Season episode. I've created a double-mix Teaser for this one to show you a spread of the theme, starting with the poignant funeral of Hawke's Vietnam buddy, John Fargo (a variation of which is used when Hawke gives Billy Fargo his brother's Medal of Honor before being arrested) and culminating in a long, melodic piece starting with the Beaudy police car chase against the escaping Hawke, leading to the build-up before the brilliantly tense final aerial (one of the longest of the series) to explain the Spaceguard missile's features and how Hawke and Dom will have to lift the lid on Airwolf's capabilities to save Washington from Nuclear annihilation. Well these two tracks have finished the end of mastering phase 1 of 3 - the pure synth tracks, so for the middle phase 2 of 3 I'm at the stage of mastering the synth orchestral mixes, which have a blend of melodic synth mixed with orchestra. So I've already done the Mk1 draft mix on 15th March for the first of these, the fan-favourite 'MIND OF THE MACHINE' (incorporating Dr Winchester's emotive theme). That is mostly melodic synth when Dr Winchester (played to perfection by the late David Carradine) and Diana Norris (played by Airwolf producer, Alan J. Levi's wife, Sondra Currie) are trialling the Airwolf simulator in the virtual canyon, to later discovering Airwolf's on-board schematics whilst poking around the electronics to the episode's final scene (and one of the best-loved by the Airwolf fans) of the poignant flight in the real Airwolf by the dying Winchester, which is mixed with real orchestra with one of Sylvester Levay's best orchestrations of the entire series, on power with his other character themes. 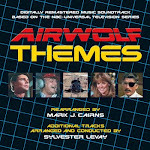 I realise Sly has already done a version of this theme for the original Airwolf Themes 2CD Special Limited Edition CD2 back in 1999 with his "1st Season Medley" track, but let's be blunt, whilst brilliant it was only a short medley of it and it's the final scene that everyone remembers best. So I decided to produce a full track of the episode to give it a fuller flavour. Jan has recently completed his mastering on CD1 Track 5 so that will be up soon on his Orchestrator's Blog and he's currently working away on two others so be sure to drop in on it regularly for progress either on his Orchestrator's blog or on the complete 2CD Tracklist here.